The Religious Education Office is located on the lower floor of Saint Christine School. 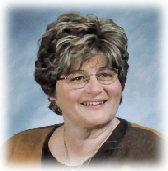 Colleen Boyle began serving St. Christine Parish in 1977 as Youth Minister. She expanded her role to Director of Faith Formation and is currently handling the catechetical instruction for grades PK through 8th and the sacramental preparation for both the parish and public school children. She received her BA from Youngstown State University and Religious Education Certification from the Diocese of Youngstown. She has also served on the faculty of John F. Kennedy High School in Warren. She has been life-long member of St. Christine Parish and she has two children. Our pastoral staff is also here to serve and support our efforts in meeting the spiritual, catechetical, and sacramental needs of the families in the parish.